A file set consists of a file for each pump and a master ppl file. Continuing with the example, you would have a ppl file for each pump and for each recipe. If you had 6 recipes and 3 pumps, you would have 18 ppl files that need to be uploaded as a set of 3 ppl files. The master file can be uploaded to any connected pump, and it will read in the ppl for each pump and upload it. Then makes all pumps involved beep in chorus signaling that the upload is complete. Limited user instructions/information can be displayed in the history window. Simple add comment lines at the end of the master ppl file. These will be placed in the history window. PPL errors are reported, a missing pump is reported. This makes it fairly easy for operators to be trained to upload the master.ppl for a recipe to any pump and wait for the pump choir as I call it. Then they can press Run All and they are pumping! Some recipes may have one or more pumps doing the same thing – that’s fine – you can re-use child ppl files in multiple recipes. 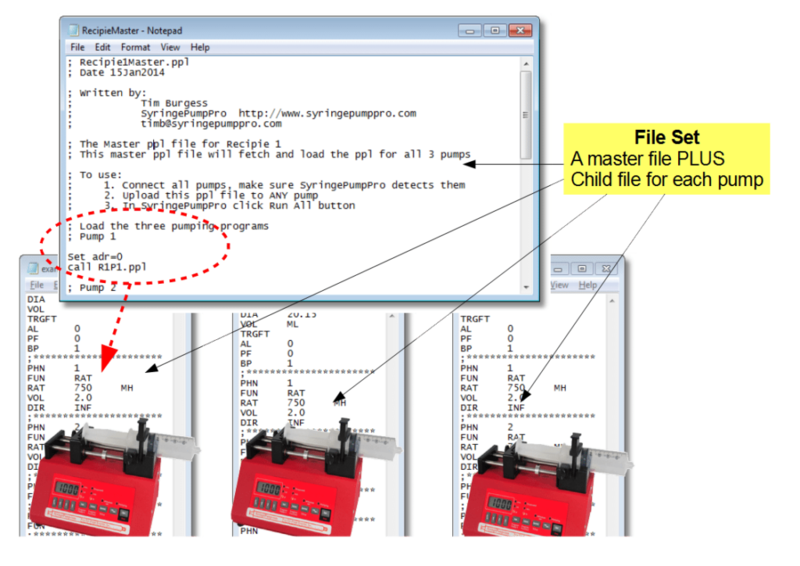 The following ppl program is an example of a master file, that uploads the three child files R1P1 (recipe 1 pump 1), R1P2, and R1P3 in to the pumps at address 0, 1, 2. This example master ppl file can be uploaded to any one of the connected pumps and it will load each ppl file into it’s target pump, and zeros the infusion and withdrawn counters, ready to run the recipe. As each pump completes it’s upload – it beeps (done at the end of the child ppl file for each pump) and when all ppl is uploaded, all pumps beep – done at the bottom of the master ppl file. Then it’s time to click Run All to start the pumps. ; Sequence 1 is being uploaded to the pumps.